“What? !” Nikita Khrushchev gasped on Oct. 28th 1962, as recalled by his son Sergei. “Is he (Fidel Castro) proposing that we start a nuclear war?! That we launch missiles from Cuba? !...But that is INSANE!..Remove them (our missiles) as soon as possible! Before it’s too late. Before something terrible happens!” commanded the Soviet premier. Well, so much for the Fake News Media, Fake Academia, and Hollywood/ Camelot's fairy tale of: “JFK standing up to the Russians in Cuba!” In fact, Khrushchev’s panic that Fidel, Raul and Che might get their fingers too close to the buttons is what got the missiles out. “Of course I knew the missiles were nuclear- armed,” responded Fidel Castro to Robert McNamara during a meeting in 1992. “That’s precisely why I urged Khrushchev to launch them. And of course Cuba would have been utterly destroyed in the exchange." But AH! Upon one of his many fond visits to Stalinist Cuba Pope Francis held an even showier mass in the company of Castro and with Che Guevara as the backdrop. Never mind that about 20 times as many Cubans have died trying to escape Castro’s Cuba as died trying to escape East “Tear Down this Wall!” Germany. Never mind any of that. And what makes this death tally in the Florida straits more horrible (and the Pope’s hypocrisy more revolting) is that prior to Castro and Che Guevara’s destruction of Cuban society, the prosperous island nation took in more immigrants per-capita (mostly European) than the U.S.
“What?” you say. But you’ve always heard that it was the other way around? That Cuba was a tourist playground for Americans? Indeed it was—but the tourist traffic went both ways, as befit a nation described by a 1957 UNESCO report thusly: "One feature of the Cuban social structure is a large middle class. So check it out here--and please click links for thorough documentation. Point is, during the 1950s and based in Florida, Sheriff Joe Arpaio would have been lonelier than the Maytag repairman. 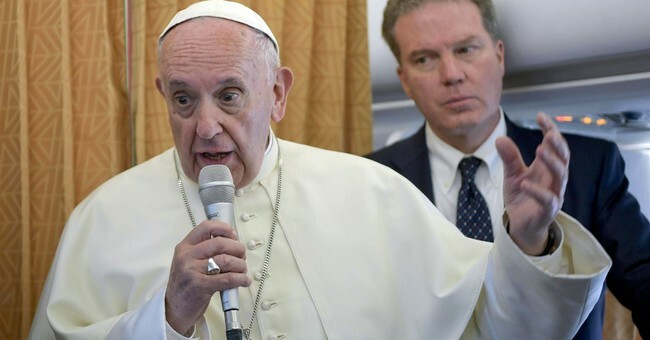 “It is the communists,” Pope Francis told the Italian newspaper La Repubblica two years ago, “that think like Christians. Christ has spoken of a society where the poor, the weak and the excluded are those who make the decisions.” Castro’s captive (literally!) press was quick to spread this bit of gratifying news. “I am not Christ or a philanthropist,” wrote Che Guevara in a letter to his mother. “I am all the contrary of a Christ -- In fact, if Christ himself stood in my way, I, like Nietzsche, would not hesitate to squish him like a worm. Yet, as mentioned: an enormous image of Che Guevara formed the backdrop to Pope Francis’s showy mass in Havana in Sept. 2015. Outrageously enough, the Castro regime has received the most papal visits recently of any Latin American nation, equaling the number of papal visits to Brazil, with a population of 200 million, 130 million of them declared Catholics. In contrast, Cuba has a population of 11 million, only a tiny fraction of which are practicing Catholics. Someone’s got some serious “‘splainin'” to do for this papal fetish of constantly visiting Stalinist Cuba and chumming around with her Stalinist rulers. Many view the Papal motivation for visiting Cuba similarly to the motivation of Beyonce, Conan O’Brien, Robert De Niro, Jack Nicholson, Oliver Stone, Sean Penn, and Jeff Fake’s etc. etc. etc.. The Popes get plenty of press and get to poke Uncle Sam in the eye. In this respect, they seem no different from all those loud-mouthed, Castro-hugging celebrity and political popinjays.